The 1st Leibstandarte Adolf Hitler Division was broken down into 4 different Kampgruppes for the Ardennes offensive, each named after their respective commander. The most famous of these was Kampfgruppe Peiper which contained all of the division’s tanks and was the tip of the spear of the “Wacht am Rhein” offensive. Our tank is designed to appear as it would have looked at the outset of the battle. The King Tiger was the successor to the Tiger I as Germany's Heavy Tank and combined the thick armor of the Tiger I with the sloping armor of the Panther along with the firepower of the 8.8 cm KwK 43 L/71 anti-tank cannon. 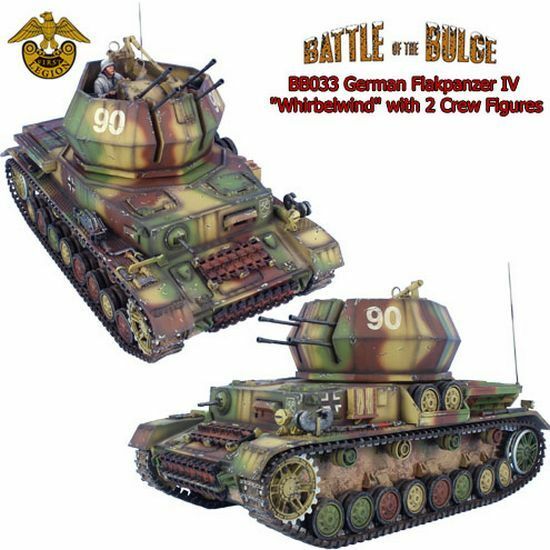 Ours is depicted wtih the Henschel turret and soft edged camo as part of the 1st SS Panzer Division's Kampfgruppe Peiper. This tank is a real beast for sure at 70 tons and our rendition of it is modeled and painted to the very highest standards including additional weathering that we haven't done on any previous vehicle. With only a very small number of them produced (less than 100), KT "334" will become a real collector's item and a fantastic addition to our Battle of the Bulge figure series.